THE HORROR SHOW: Sean Cunningham Has A Nightmare On Craven Street – Schlockmania! Sean Cunningham and Wes Craven didn’t make another film together after Last House On The Left but their careers would end up being very similar. Both men became reluctant brand names of the horror genre, finding it was easier to make films in this vein if they wanted studio backing. The strangest moment of similiarity in their careers arrived in 1989 when Craven made Shocker, a film about a death-row inmate who used electricity and dreams to attack the living – and Cunningham produced a film with the same premise around the same time. 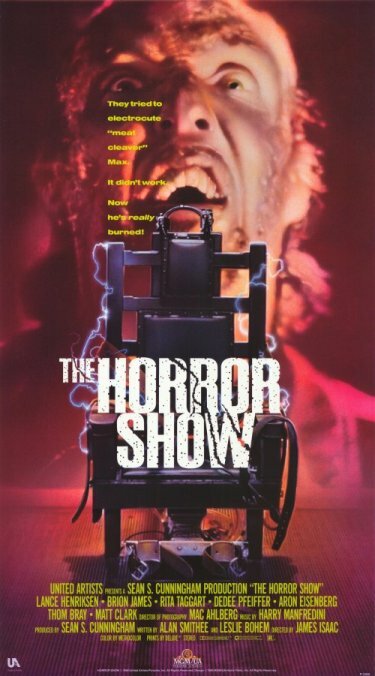 Cunningham’s film was called The Horror Show and it shows him borrowing a few page from Craven’s playbook to create a film suited to the horror audience’s needs circa 1989. The hero is Detective Lucas McCarthy (Lance Henriksen), a cop whose sanity has been tested by the evil of a serial killer he apprehended. The villain is the serial killer in question, Max Jenke (Brion James). He’s set to be executed in the electric chair as the film begins and Lucas shows up to witness it. Max takes more juice than is normal and vows to come back before expiring. And that’s exactly what Max does: he begins to appear in Max’s dreams, causes strange hallucinations and takes up a ghost-style residency in the McCarthy household, which also includes a wife (Rita Taggart) and two teenage kids. Lucas’ only hope in stopping these terrors is a weird scientist (Thom Bray) who has a theory that might explain why Max appears to be haunting the house from beyond the grave. Everything culminates in a finale that owes a debt or two to A Nightmare On Elm Street. The results offer an interesting example of where the horror film was at on a mainstream level as the ’80s came to a close. It’s a weird mix of generic storytelling conventions – the haunted cop, the evil serial killer, the sitcom-ready family members – combined with attempts at surreal, “waking nightmare” horrors of the Craven-esque variety. The dream horrors get so arch they cross the line into morbid camp territory, like Max’s face appearing on the turkey Lucas is trying to carve on the dinner table or one character’s severed head giving Lucas helpful advice before suddenly exploding! As a result, The Horror Show is more memorable for its weirdness than its scares or originality – but it brings a level of craftsmanship to the proceedings that ensures it remains watchable. The acting plays a big role in this. The film anchored by two strong lead performances by Henriksen and James: neither has much to work with but Henriksen is instantly believable as a battle-weary cop and James hams it up with appropriate brio. Bray and Taggart lend solid support, as does veteran character actor Matt Clark in a brief role as Luca’s psychiatrist. The direction by former FX man James Isaac has a nice grasp of pacing and gets plenty of atmosphere from Mac Ahlberg’s cinematography, which includes a lot of sleek Steadicam moves. In short, The Horror Show is primarily a curiosity piece for ’80s horror addicts and anyone else who was ever obsessed with the Nightmare On Elm Street series. You might not walk away scared but the film offers some moments of FX-laced weirdness that may stick with you afterwards.